A Nationwide Outpouring Of Support For Tiny Ferguson Library : The Two-Way The Ferguson Public Library has become a refuge for community during a difficult time. In response, donations to the library have reached "several orders of magnitude" higher than ever. 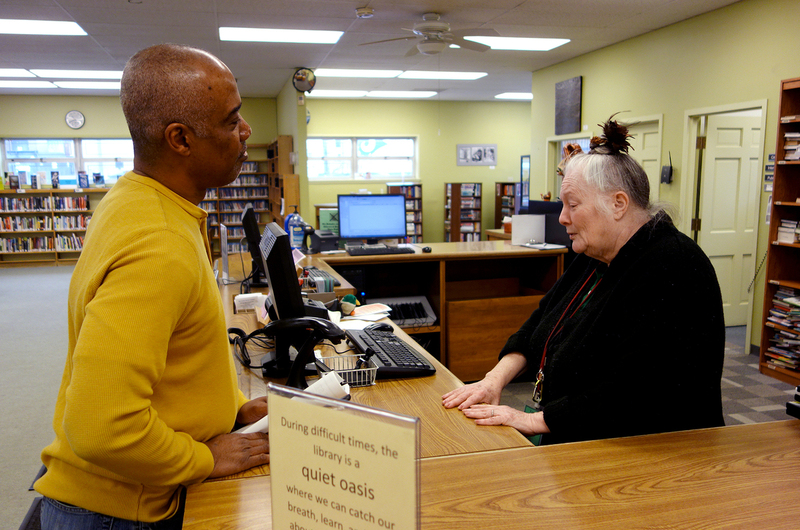 Library volunteer Jeanne Million talks with Ferguson resident Phillip Sampson at the Ferguson Public Library. It has become a quiet refuge for adults and children alike in this St. Louis suburb. And the nation has taken notice. The outpouring of support for the library has reached "orders of magnitude" more than any previous amount, says library Director Scott Bonner. He's the only full-time librarian there — and he started his job in July, just weeks before the town became an internationally known name. Bonner says the donations may allow him to hire another person to help. 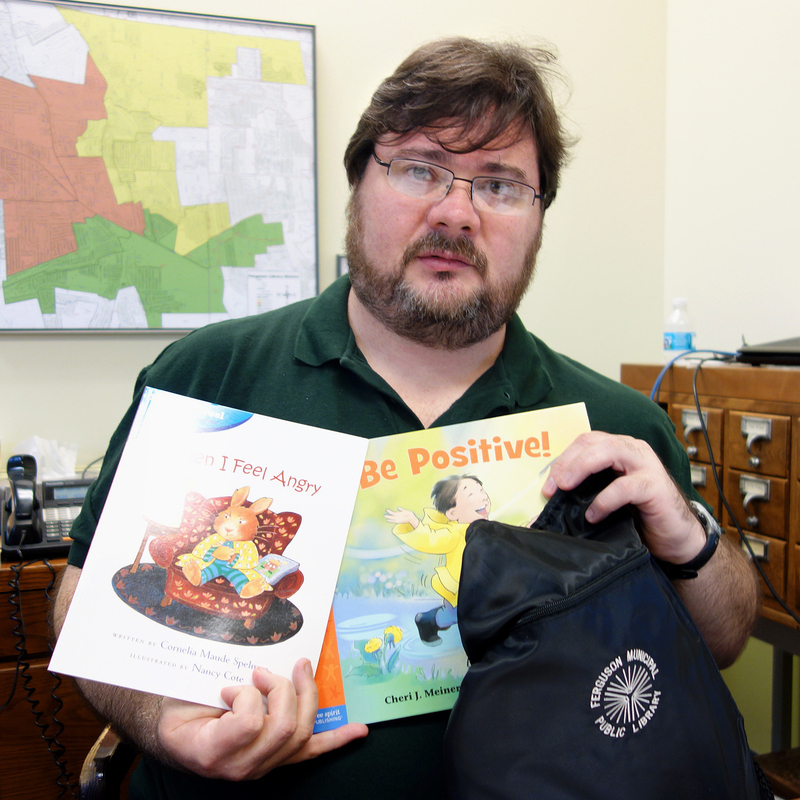 Scott Bonner, the Ferguson Public Library's director and its only full-time librarian, holds one of the "healing kits" that kids can check out. For community leaders and business owners, the library has become a place to convene. "Whenever businesses have been hit, North County Incorporated needed a meeting space, and I said, of course, yes. Small Business Administration came in and did staging of emergency loans out of the library," Bonner says. "When there's a need, we try to find a way to meet it. I have a very broad definition of librarianship." Since the latest unrest began Monday night, more than $175,000 has poured in. More than 7,000 people had given something as of Wednesday afternoon, many in $5 and $10 amounts. Donations so far this week are 10 times what they were during protests in August. It all started with a few tweets from the library's account, which Bonner's wife helps with in her free time. "Before I knew it, [there were] thousands of tweets with encouragements to donate, including retweets from people such as Neil Gaiman and LeVar Burton," Bonner said. With the donations this week, Bonner plans to purchase more "healing kits" for children to check out. The kits include books about dealing with traumatic events and a stuffed animal that they can keep. The level of support the library has seen this week can buy even more than healing kits. "It means we can do a whole lot more programming that's focused on the community, [and] long overdue updates to the library. We have infrastructure needs that should have been taken care of 10 years ago. But what I really hope I can do is to get a full-time children's or programming librarian," Bonner says. "No matter how much I work," he says, "it's not anywhere what a dedicated person who thinks about community all the time can do."